“Celebrating our language, our culture in our multicultural Australia”, the first ever Indian Community Languages Schools Parents & Teachers Conference in Australia was hosted by School of Vedic Sciences. Aimed at creating synergy among the Indian communities to work together and contribute towards sustenance, teachers and parents of Sanskrit, IABBV-Hindi School, Bala Malar Tamil School, Green Valley Hindi School, Punjabi, Marathi, Telugu, Malayalam and Urdu schools flocked to share their knowledge and expertise through structured presentations and workshops. An initiation of the School of Vedic Sciences (Aust) Inc. the event was supported by Community Languages Schools Program, Department of Education under the Communities United through Language reform initiative of NSW Government and NSW Federation of Community Languages. There are over 55 languages and 250 community language organizations in State of NEW South Wales. India could be the only country to have a vast representation of Community Languages. Gopal Subramanian welcomed the guest’s and thanked the community for the extraordinary support for the event as well as attendance on a wet winter Sunday. Saumya Raman, former student and current teacher of Sydney Sanskrit School as the MC invited Ranjani and Rashmi to formally inaugurate with singing Ganesha Vandana, followed by lighting of the lamp, signifying dispelling ignorance, by Dr. Vinod Bahade, Deputy Consulate General of India, Mr. Raj Datta, Councilor Strathfield Council and Prof Nihal Agar, President Hindu Council of Australia. Dr. Vinod Bahade commended the school and the communities for participating in the conference. Indian culture is expressed through its culture, religion and languages and is celebrated by Indian emigrants’ world over. Community language schools not only teach language but connect them to India and Indian culture through languages, he said. He was pleased to know that the Australian Curriculum, Assessment and Reporting Authority (ACARA), has incorporated Hindi in the national curriculum for HSC and similar been adopted by many universities, highlighting the importance of Indian Australian relationship. He felicitated Mrs. Mala Metha for her exemplary service and leadership in establishing Hindi as a community language in Australia. Dr Nihal Agar, President Hindu Council of Australia highlighted the importance of knowing “matru basha” mother tongue, commended the school for its maiden effort and wished that it becomes an annual event. Mr. Raj Datta, Councilor Strathfield Council, highlighted wisdom of the Indian civilization dating back over five thousand years and had significant wealth to offer to Australia as a whole. He cautioned against showcasing the culture as a trophy stressing that the culture cannot flourish unless children practice it and promote it in the society. “This will pave the way for persons of Indian heritage to aspire for high ministerial and prime ministerial positions” the Councilor iterated. Gracious in acknowledging the contribution of her teachers and community, Mrs. Mala Mehta, recalled how she had pioneered the Hindi school in 1987, seeing the hesitancy of new migrants in their new land. The need to retain their cultural identity helped them blend with confidence in the Australian society and release their true potentials. She cited examples of students of community language schools reaching high levels in organizations besides coming back to contribute to the wider community. She acknowledged and thanked Mr. Albert Vella, President of NSW Federation of Community Languages Schools (NSW FCLS), Department of Education, and Hon Geoff Lee, Parliamentary Secretary for their support to community language schools program and lobbied to increase funding for schools. 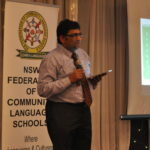 Applauding Mrs. Mala Mehta on her accomplishments and the School for organizing the conference Geoff Lee, State Member for Parramatta observed the low levels of second language learning in NSW schools despite high levels of immigration. Teenagers have peer pressures in wanting to be a typical “Aussie kid”, which is often at the expense of their ability to retain their own language. Community Language schools are crucial in enforcing the link. He complimented Mala Metha for her pioneering work in Parramatta Public School for introducing Hindi. He released the conference proceedings “Sulekhasangraha”-Compendium of articles”. 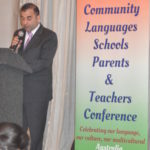 Albert Vella, President NSW FCLS commended the organisers for the conference and highlighted the difficulties faced by Community Language schools in terms of funding and resources. He stated “most people are not aware of the logistics of running a language school”. Pitching the case of increasing funding he cited“ Victorian government offers per-capita grant of over $200 per student, South Australian community language schools’ grant similar amounts whilst NSW lags being at around $125”.He acknowledged the NSW Government funding of about $400K for the professional development of teachers of community languages schools under the ‘communities united through language’ announced last year, a result of lobbying by NSW FCLS, and the community languages sector would greatly benefit from this initiative. 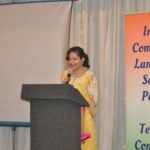 In her keynote address “Contribution of Indian Languages to Multicultural fabric of Australia”,Ms. 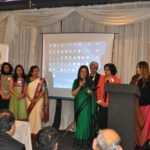 Pallavi Sinha highlighted the importance of language in connecting individuals to their roots, the vital role of languages in peaceful coexistence of mankind and the need to develop and fund multi-lingual capabilities in a globalised world. Mrs. Nalini Shankar in her session “Importance of language learning in sustaining our culture in Australia” asked participants to list the languages they knew on a post-it note. Many of participants were multi-lingual with some knowing up to six languages. Held up against a map or Australia highlighted the linguistic capability migrants have enriched the nation with. Current approaches to teaching an Indian language session followed by Tamil, Punjabi and Sanskrit teachers. Tamil school teacher and Principal Mrs. Sowmya Bheem spoke of encouraging student learning experience through cuisine. Students were encouraged to prepare a recipe using their cultural ingredients and make a dish. Punjabi school teacher Ms. Amanpreet Kamal show cast role playing as a means of learning Punjabi. She described the mock surgery that was prepared with students playing as doctors, nurses, patients and administrators. It was wonderful to see ingenious methods of teaching resources developed with limited resources and unlimited passion. Mr. Thiru Thirunanthakumar in his session about reporting management highlighted the need for consistent, progress update involving the parents and the need for positive feedback which would enthuse students. “A student MUST never fail in language”, he emphasised to the teachers and also signified that regular positive feedback to children keeps them engaged in learning the community language. “Use of fun activities to teach language in a cultural context” was facilitated by Dr. Meenakshi Srinivasan and faculty of Sydney Sanskrit School. 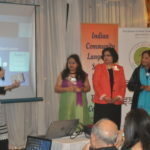 The workshop demonstrated language learning related fun activities that accentuated the use of four ‘I’s – Inspiration, Inclusion, Impression and Innovation, a unique methodology adopted by the school. Teachers thoroughly enjoyed the hands on activities and found the workshop very useful. They noted the simple fun activities such creation of song, rhyme and or as simple as making a cultural activity based theme card in the community language was in line with the mainstream language learning experience of a child. “Identify task based activities that bridge the gap between community language learning at school and home” was facilitated by Smt Mala Mehta OAM and faculty of IABBV Hindi School. The workshop gave practical suggestions through various presentations on synergising community language learning at home and at school in the Australian environment. “Current approaches to teaching an Indian language” was also presented by Mr. Nitin Gore and Mansi Kanitkar – Marathi and Mr. Mallik Rachakonda -Telugu teachers. All the presentations amplified the need for sharing ideas to address the common issues in teaching a community language. Dr. Sai Lakkaraju hosted a session on “Classroom management in a community language school setting and managing parent expectations”, an analysis of the issues facing community language schools, administrators, teachers and students alike. The session concluded by a demonstration of a software package developed for administration and teaching community language schools by Syscorp. 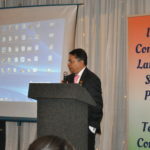 “One of the key highlights of this professional development day was the eagerness of the participants to attend similar professional development activities that brings all the Indian community languages school fraternity together – a long awaited opportunity that has materialised in 2016” remarked Karthik Subramanian, President of School of Vedic Sciences. Thanking all the dedicated and tireless volunteers of the organization who conceived and implemented this in a very short time, Karthik said “we look forward to many more opportunities to celebrate our language, our culture in our multicultural Australia”. School of Vedic Sciences (Aust), in 2006 pioneered the establishment of the First Community Language Sanskrit School in Australia. Since its inception the school has lead the way in incorporating Australian teaching methodology in community language learning, composing Australian anthem in Sanskrit, collaborating with the Aboriginal Community to release a bi-lingual sing along CD in Sanskrit and Dharawal (language of Aboriginal Australians in South of Sydney).